I don’t know about you, but I’m ready for summer! Between the crazy weather, trying to potty train the babe, and keeping up with the cooking, cleaning, cooking, cleaning, and cleaning, I’ve got my sights set on some exciting and fun family stuff. In just a couple of weeks the preschool the wee tot has been attending – and I’ve been helping out at – is closing up shop for the summer. I’m looking forward to a bit more free time, but know my daughter will miss her friends – and all the cool stuff at the school. I’m not looking forward to the loss of that bit-o-income. With less work comes less money. I needed some inspirational free activity ideas quick. We have been spending tons of time working outdoors turning the yard into more than just a dirt lot (which it REALLY was) and fixing up that dry, barren spa deck. But the tot was going to need more than bubbles and popsicles to fill her days. Yeah, there’s lots of free family fun out there like going on a nature walk or taking a bike ride, but I needed something that would hold the wee tot’s attention – something that would last more than a couple of minutes. The Motherboard offered inventive suggestions from moms all over facing the same budget-tight summer situation, which helped me feel less at a loss over my empty pockets, and ready for the challenges of summer. My real mommy-moment of ingenuity happened when I came across the idea of putting a tent out back and heading outdoors into the always exciting wonders of the yard – maybe even for the night! Well, I’m just not sure if I’m ready for the overnight thing, but we could set something up perfect for play-time! For less than twenty smackers, I put together a fun and whimsical teepee perfect for the toddler. She can take her books in there, entice me to sit with her, and cook up some dirt concoctions. 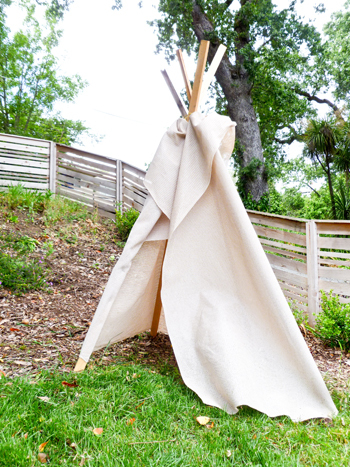 All you need to create your own just-about-free teepee are four or five 6-foot garden or tree stakes (1×2’s work great, too), and a 6-by (at least) 4-foot wide length of outdoor shade cloth, which you can find at your local garden center. Stakes or 1×2’s run around $1.50 each and the shade cloth I picked up cost about $10, so materials added up to less than $20! Select a nice level spot for your teepee, grab the hammer, and pound those stakes in at a slight angle in a circle formation. You want the stakes to criss-cross and meet at the top of the teepee. My tot was more than excited (insistent) to offer a helping hand, which made the creation of the base of our teepee somewhat (NOT) easier. If your ground is a bit hard, let a sprinkler run in the area for 10-minutes or so, and then try tapping the stakes in again. Help secure your teepee by tying the tops of the stakes together with a length of colorful string or some twine where they criss-cross. 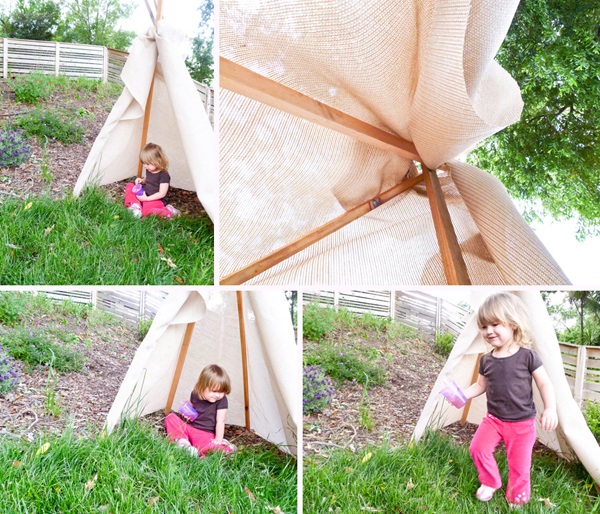 Now cover your teepee base with the shade cloth and, with the help of a staple gun, hold everything tightly together. I started by wrapping one end of the fabric around a stake and stapling, and kept working all the way around the teepee. Then I used a scissors to cut away any excess fabric, leaving a bit extra at one end to act as a door flap. I used four old redwood 1×2’s for my teepee that were hiding under the house. Lengths of bamboo would great, too! And, if you don’t feel like splurging on sun cloth, burlap, an old sheet, or even a blanket would cover your teepee wonderfully!